Severe Tropical Cyclone Yasi began developing as a tropical low northwest of Fiji on 29th January and started tracking on a general westward track. The system quickly intensified to a cyclone category to the north of Vanuatu and was named Yasi at 10pm on the 30th by Fiji Meteorological Service. Yasi maintained a westward track and rapidly intensified to a Category 2 by 10am on 31st January and then further to a Category 3 by 4pm on the same day. Yasi maintained Category 3 intensity for the next 24 hours before being upgraded to a Category 4 at 7pm on 1st February. 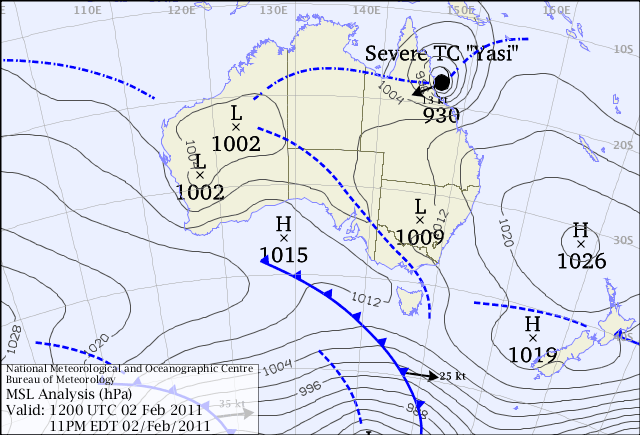 During this time, Yasi started to take a more west-southwestward movement and began to accelerate towards the tropical Queensland coast. Yasi showed signs of further intensification and at 4am on 2nd February and was upgraded to a marginal Category 5 system. Yasi maintained this intensity and its west-southwest movement, making landfall on the southern tropical coast near Mission Beach between midnight and 1am early on Thursday 3rd February. 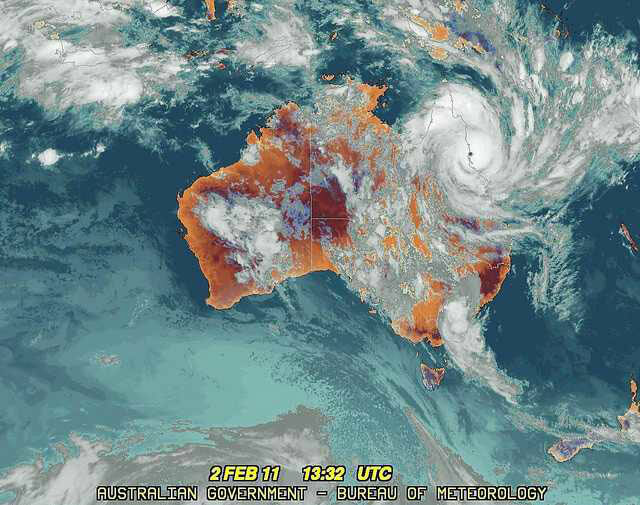 Being such a strong and large system, Yasi maintained a strong core with damaging winds and heavy rain, tracking westwards across northern Queensland and finally weakened to a tropical low near Mount Isa around 10pm on 3rd February. 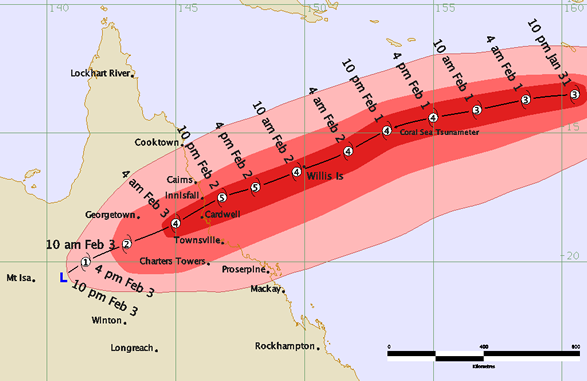 Yasi is one of the most powerful cyclones to have affected Queensland since records commenced. Previous cyclones of a comparable measured intensity include the 1899 cyclone Mahina in Princess Charlotte Bay, and the two cyclones of 1918 at Mackay (January) and Innisfail (March). 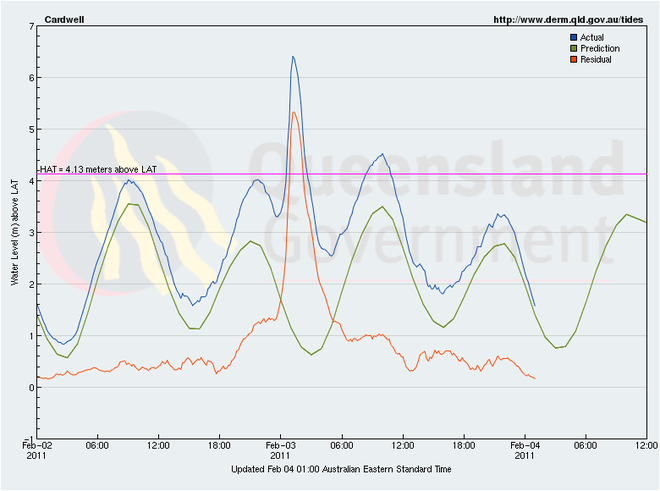 Storm tide levels during the passage of Severe Tropical Cyclone Yasi at Cardwell. from www.qld.gov.au/tides ccby. 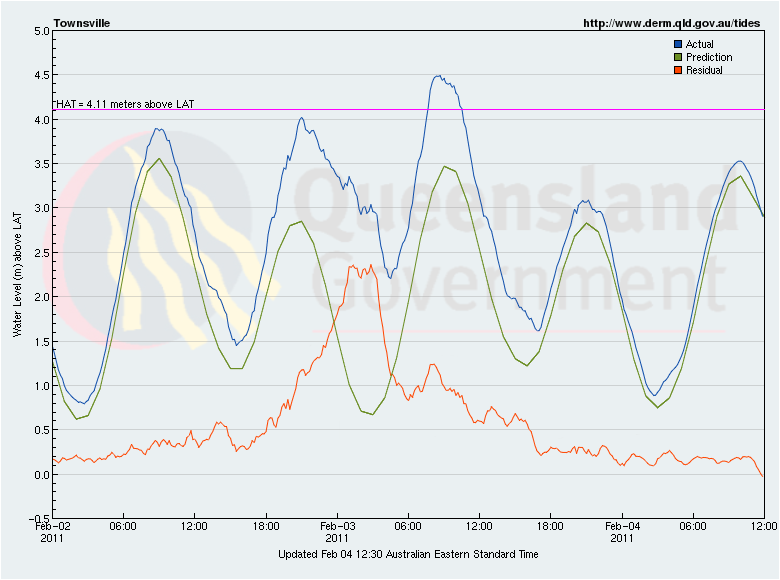 The peak storm surge occurred at low tide at Cardwell ; the pre- and post- crossing storm surge in addition to the existing tide level pushed the total water level above the Highest Astronomical Tide level near the time of predicted high tides. Storm tide levels during the passage of Severe Tropical Cyclone Yasi at Townsville. from www.qld.gov.au/tides ccby. 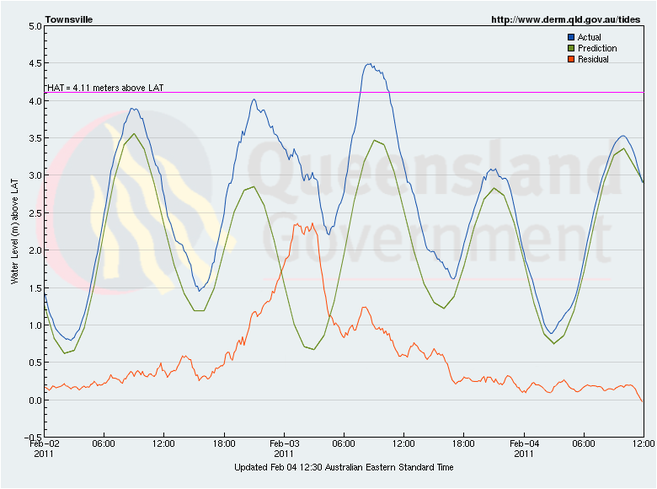 The peak storm surge also occurred at low tide at Townsville ; the pre- and post- crossing storm surge in addition to the existing tide level pushed the total water level above the Highest Astronomical Tide level near the time of predicted high tides. Storm Tide levels and facts from: www.qld.gov.au/tides (CCBY) and Tropical Cyclone Yasi fact sheet, DSITIA (CCBY).